Route. Seatoller - Strands Bridge - Thornythwaite Fell - Combe Head - Rosthwaite Fell - Tarn at Leaves - Bessyboot - Rottenstone Gill - Combe Gill - Strands Bridge - Folly Bridge - Seatoller. Notes. 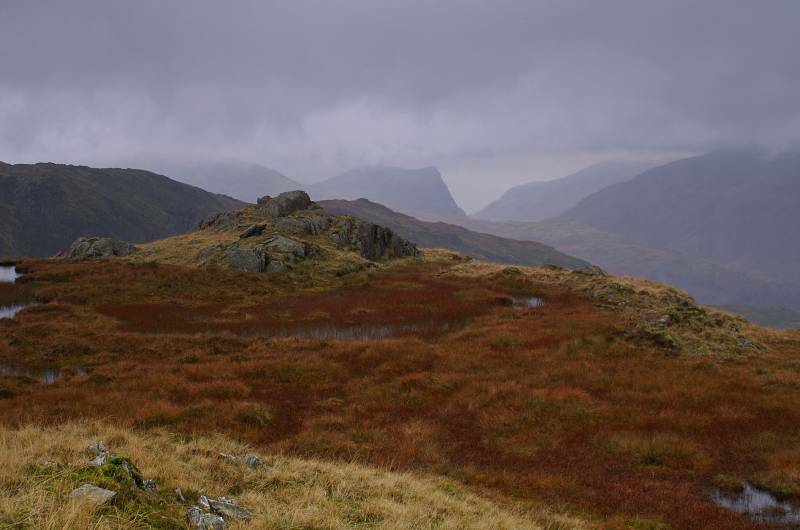 It was a grey day in Lakeland today, I spent almost all morning walking through the rain, not heavy just persistent making some descents treacherously slippery. 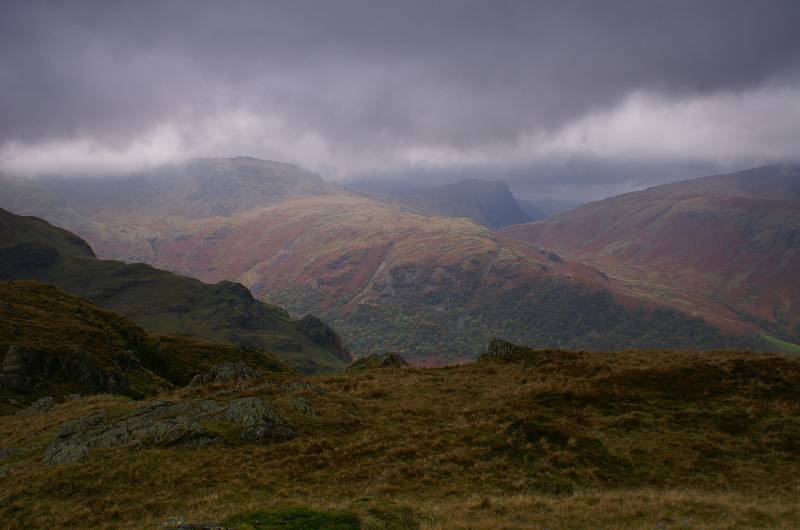 I did a small horseshoe I'd been promising myself to do for ages, I had hoped to show you some Lakeland giants from a different angle, unfortunately low cloud put paid to that. My day started dry in the small National Trust car park at Seatoller, my route took me back down the main road to Strands Bridge, here a footpath on the right invited me to Seathwaite, I followed this leaving the path at the first stile, this marked the start of my ascent, long but relatively easy, it also signalled the start of the rain. 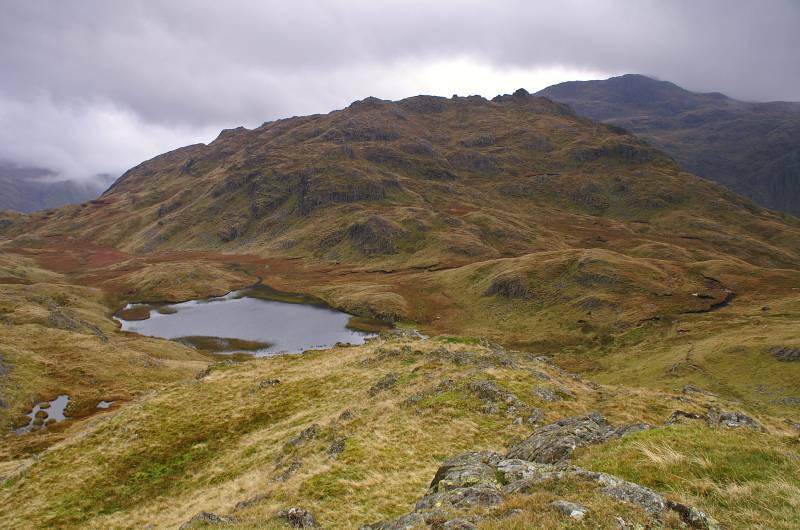 The path ascended over Thornythwaite Fell, steadily gaining height to reach Combe Head, here my route swung east passing several small tarns before turning north descending to Combe Door and more small tarns. 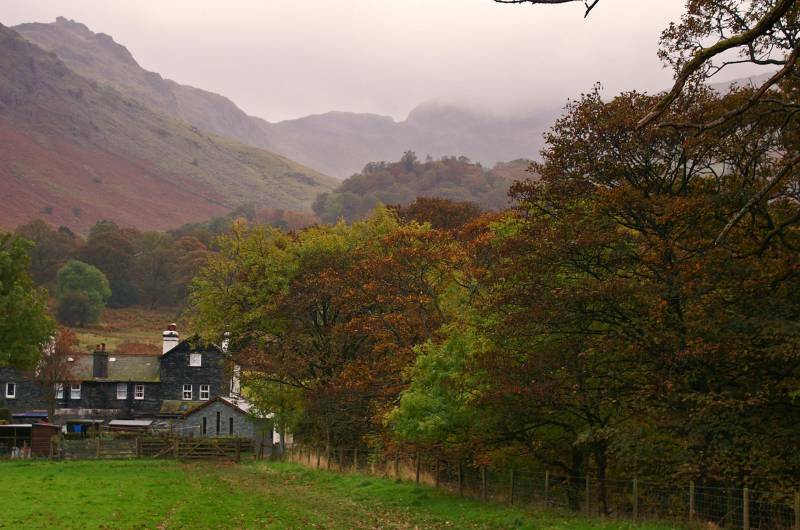 I'm walking on new ground, I'd never set foot on these hills before, there was little sign of a path and I've just walked into grey emulsion, gingerly I set off on a compass bearing, the mist came and went several times as I made my way over Rosthwaite Fell. 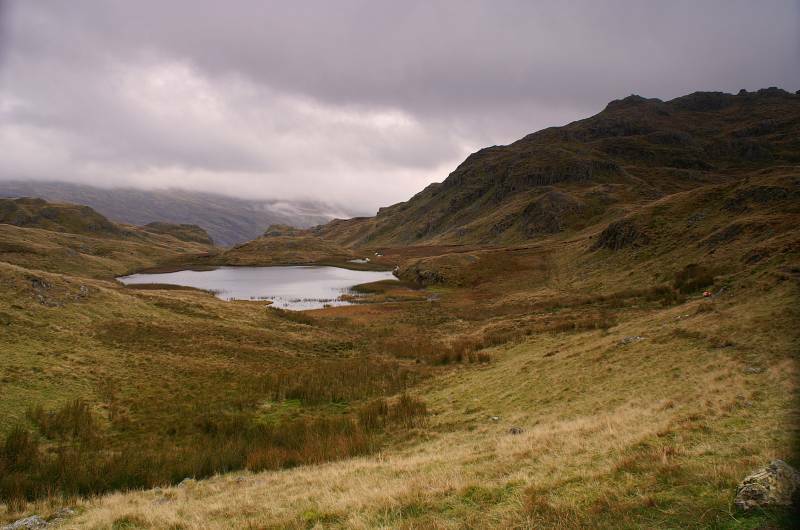 My route passed under, over and round lots of rocky knolls, I descended a number of slippery gullies, as I crossed Rosthwaite Cam, Tarn at Leaves came into view nestled in a swampy hollow far below me, it was reassuring to be back on familiar ground and I'd found a path, I descend to the tarn a good lunch stop. After lunch I nipped to the summit of Bessyboot before plotting my way off the hill. My descent followed the banks of Rotterstone Gill, when the main path swung right I carried on down hill, descending a grassy ridge to reach Combe Gill, I carefully forded the gill to retrace my steps to Strands Bridge where I crossed the road to follow a footpath to Folly Bridge, here I joined the path to Seatoller. 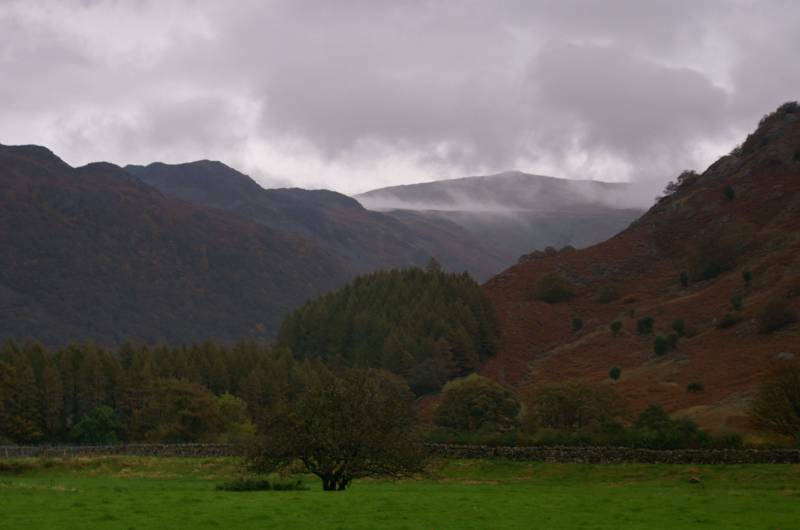 Looking to Rosthwaite Cam from the small car park at Seatoller. 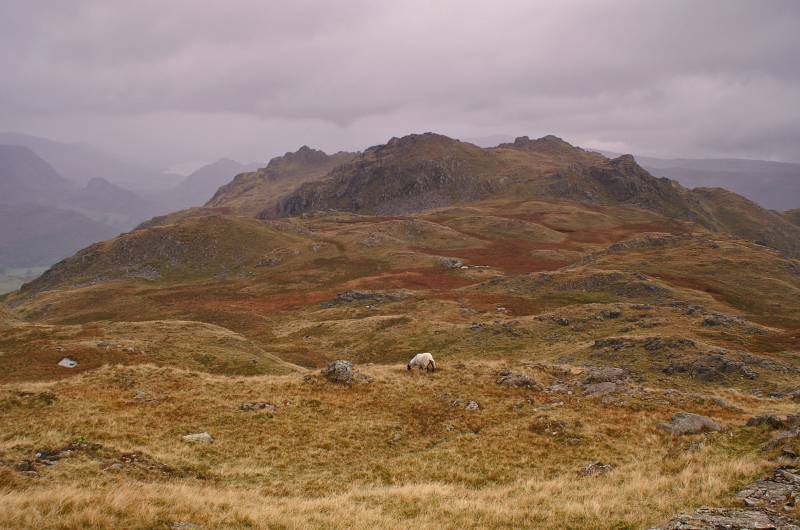 Base Brown seen from a small copse at the start of my ascent. 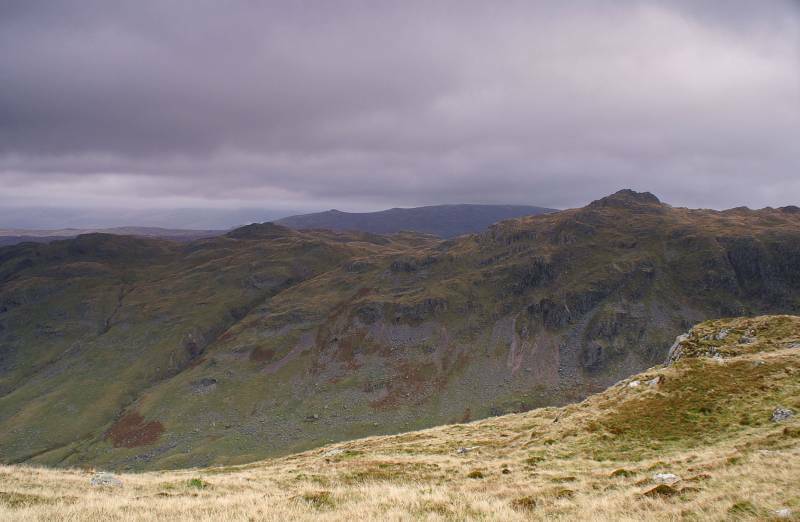 Above the tree line Lowbank Crags with the bulk of Dale Head rising to the right. 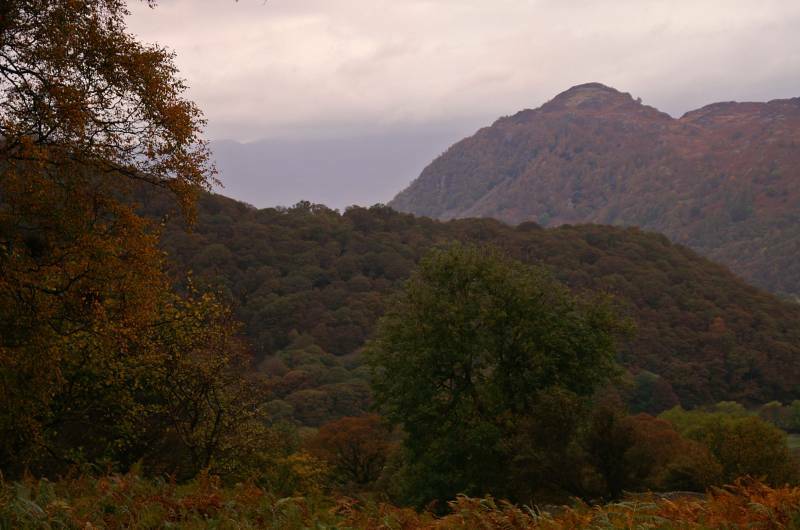 The golden slopes of King's How rising above Johnny Wood. 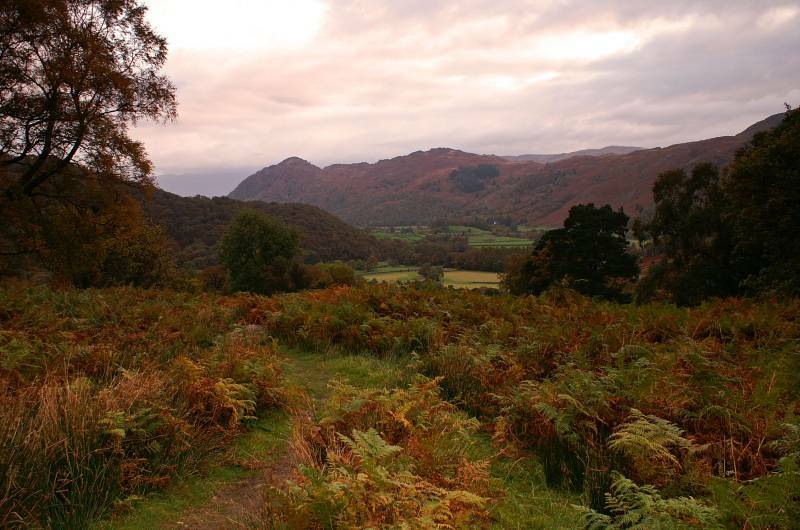 Looking to King's How and Brund Fell above Borrowdale. 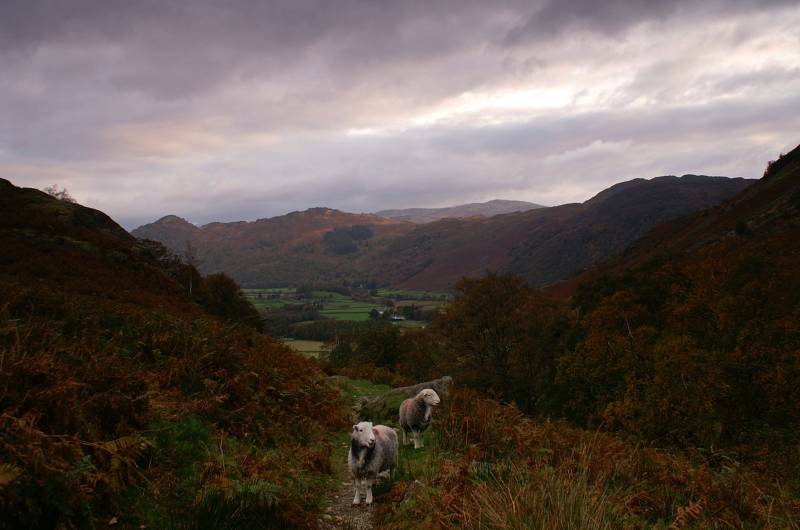 I'm being followed by a couple of locals, I guess they don't know how lucky they are living in these hills. On Thornythwaite Fell looking to Rosthwaote Cam. 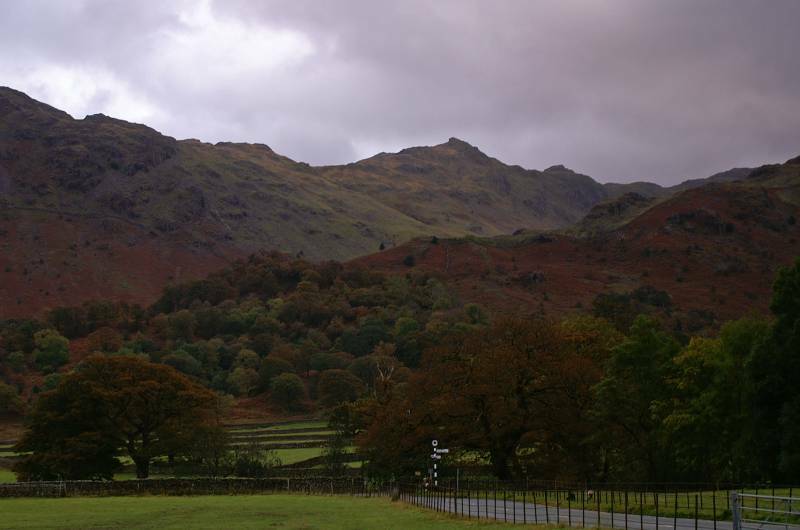 The sharp profile of Honister Crag better known to Wainwright baggers as Fleetwith Pike. Lovely golden colours at Combe Door. The trackless waste of peat bogs, swampy hollows and rock strewed gullies leading across Rosthwaite Fell, a lot rougher than it looks. Dale Head and Fleetwith Pike drop in to Honister Pass, through the pass the slopes of Robinson. 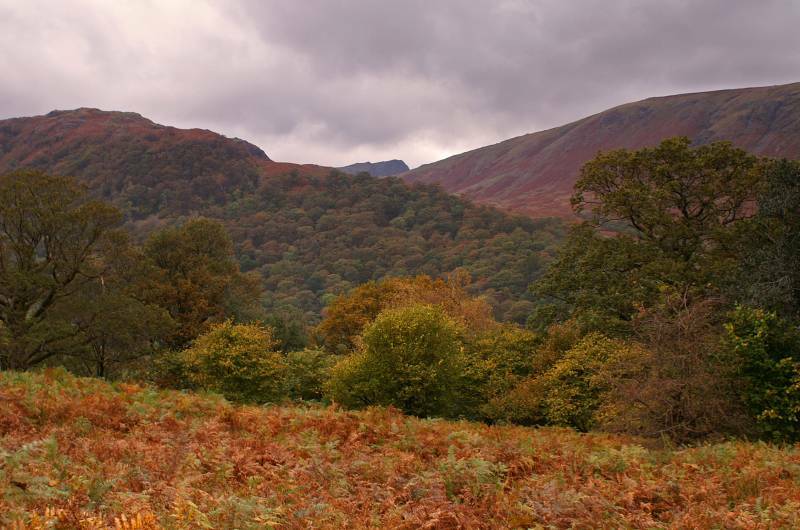 A delightful view from Rosthwaite Cam, Tarn at Leaves backed by Bessyboot. 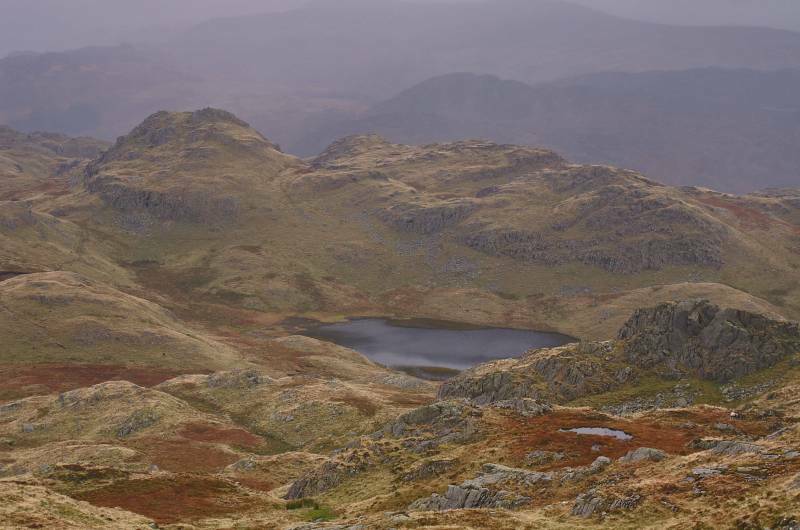 Nestling in a swampy hollow on Rosthwaite Fell, Tarn at Leaves my favourite mountain tarn, quiet, unspoilt, never any wild campers, few people come this way it's a real magical place, long may it stay this way. 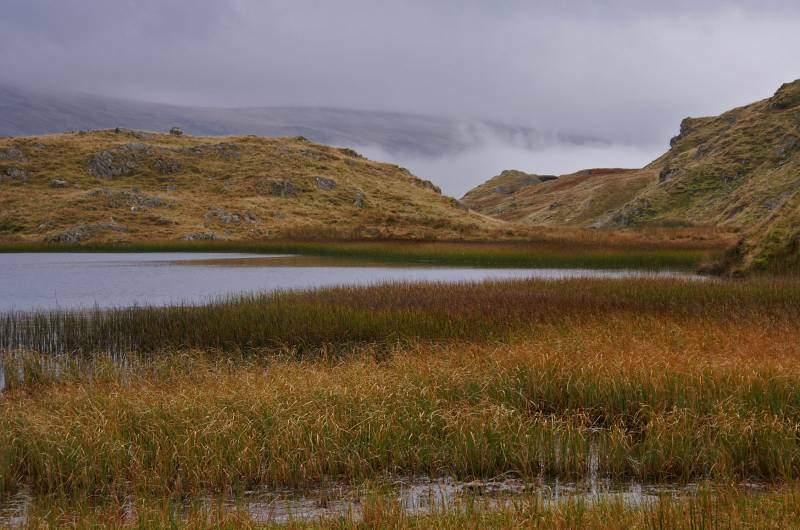 I'm sitting having lunch with this wonderful view for company, under cloud the slopes of High Raise, Tarn at Leaves with Rosthwaite Fell rising to the right. 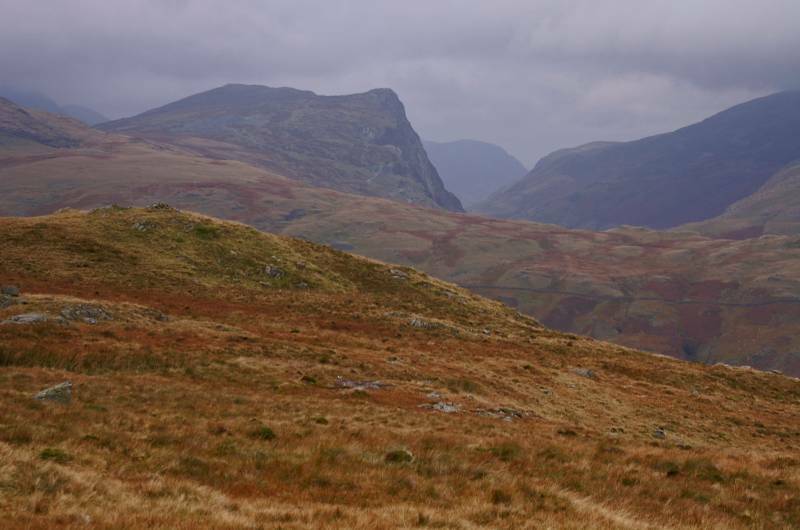 Seen from the summit of Bessyboot, the high ground across upper Borrowdale, on the left Grey Knotts, the right Dale Head with Fleetwith pike standing proud in the centre marking the descent into the Buttermere Valley. 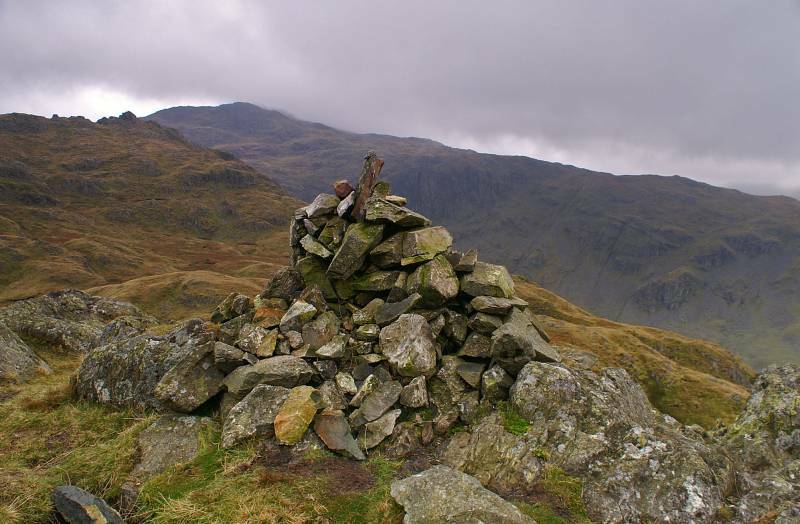 The summit cairn Bessyboot looking to Combe Head over Rosthwaite Cam. 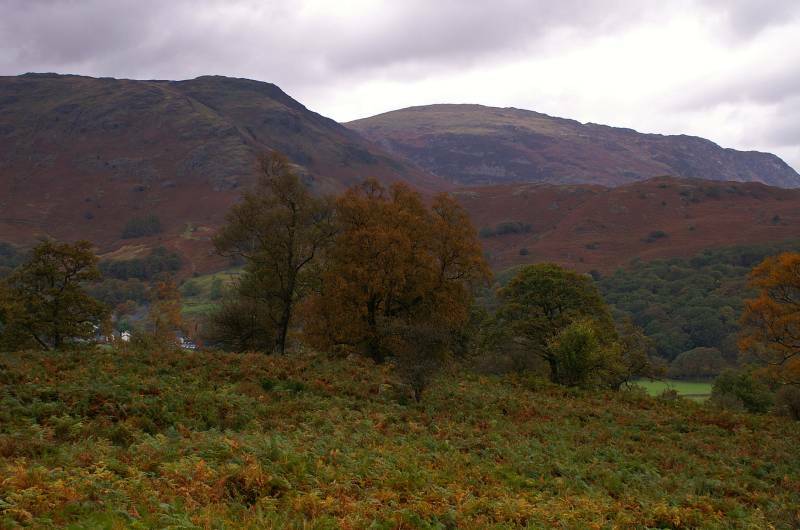 Rosthwaite Cam above Tarn at Leaves. 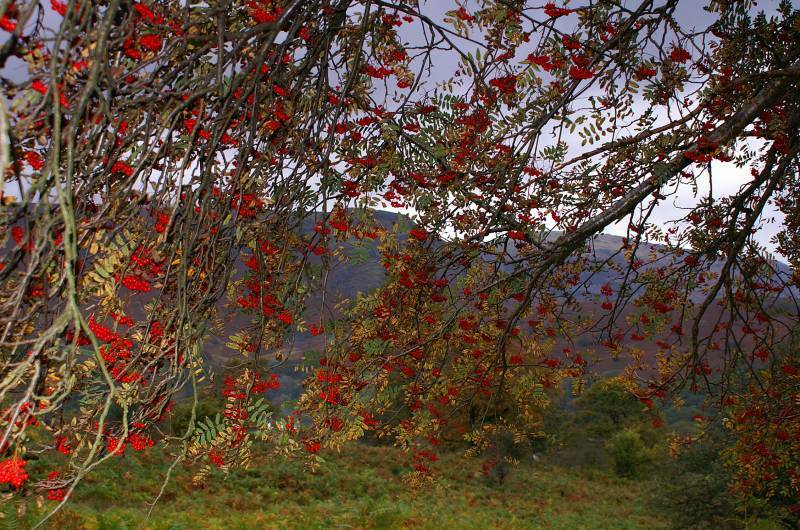 Under the berry laden branches of a Rowan Tree. 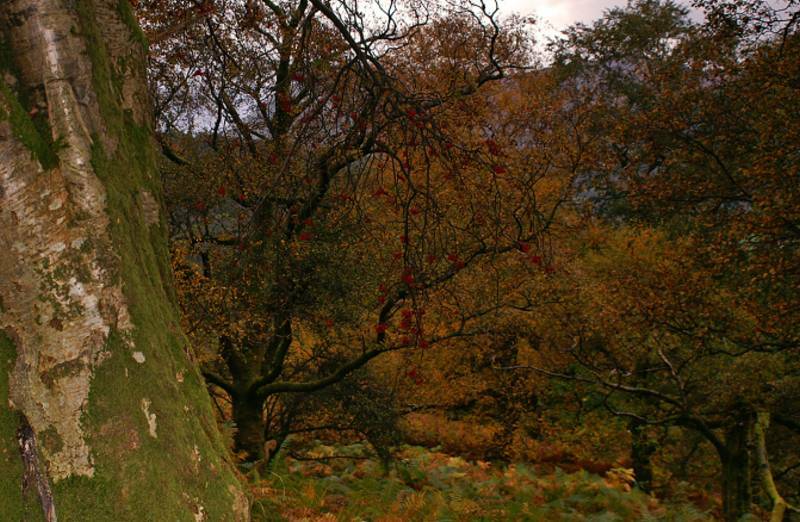 Rowan was often planted beside ancient tracks particularly Corpse Roads, it was believed to keep evil spirits at bay, especially in Scotland. Descending through the copse I'd ascended through earlier today. 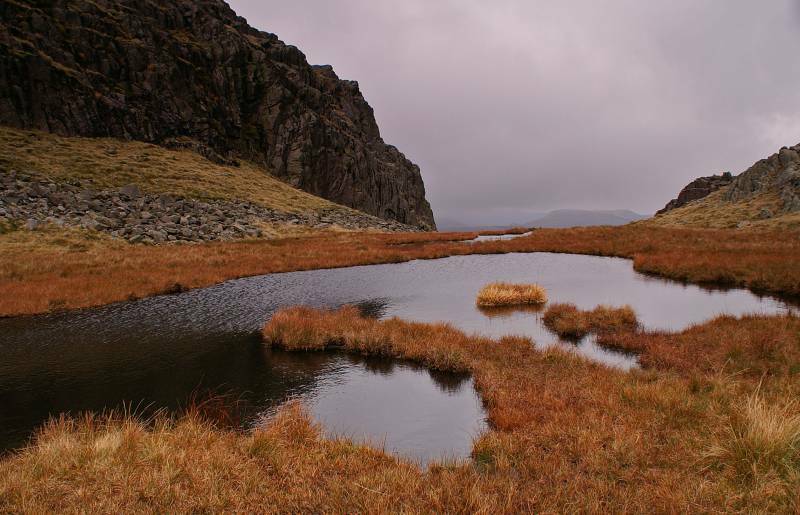 Dale Head and High Spy rising above High Doat. 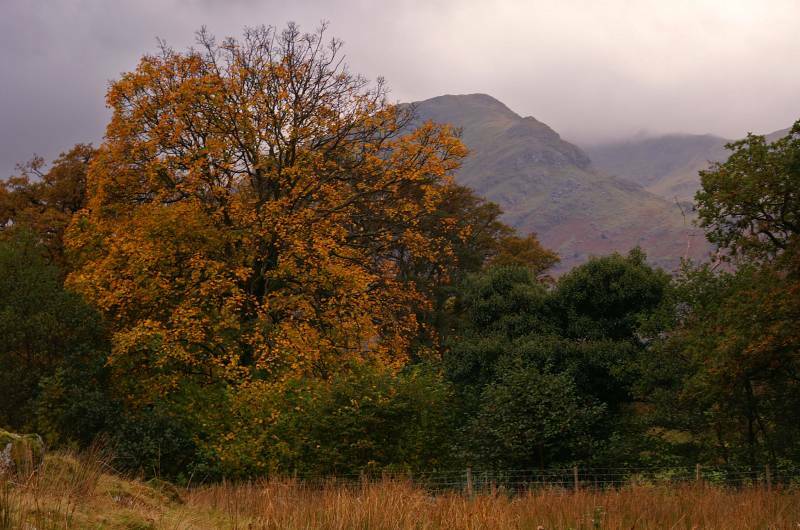 Looking to Coldbarrow above Stonethwaite as seen from the fields behind Mountain View. Hills climbed earlier in the day, it looks like the weather's really closed in up there.